Oceania Insignia has recently emerged from a 16-day dry dock, the first ship in Oceania’s Regatta-class to receive extensive renovations as part of OceniaNEXT, Oceania Cruises’ $100+ million refurbishment project. 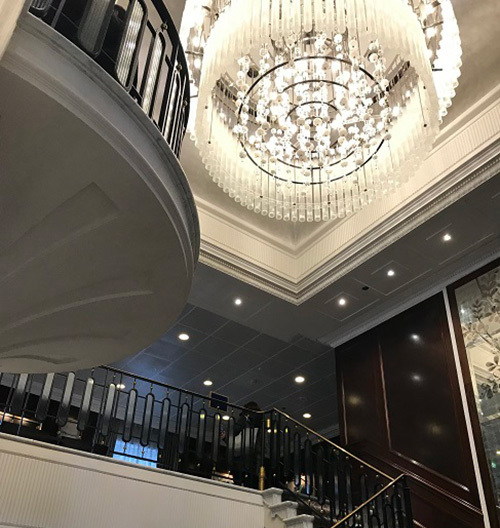 Stunning new chandeliers have been added to the Grand Dining Room and the iconic Grand Staircase. The stairs have been removed from the Grand Dining Room in favor of a ramp entrance. Public spaces have new designer furnishings, fabrics, and custom light fixtures and are decorated in a soft sea and sky color palette, giving the public areas a more airy feel. The hallways have been brightened as well with this new color palette. New contemporary artwork is on display throughout the ship. Horizons is a more welcoming and brighter environment with lighter furniture and carpet and now features an unrestricted view of the sea. Martini’s features a “barnacle wall” – an installation of taupe glass balls – and is anchored by another new chandelier. 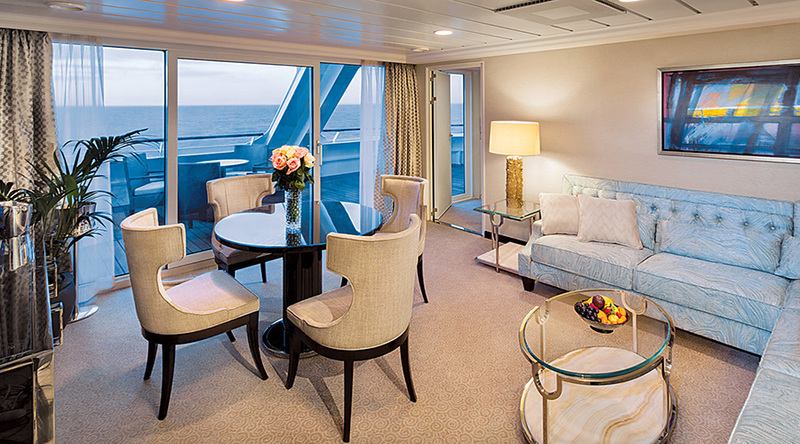 Every suite and stateroom has been designed to feel like a chic Parisian apartment or sleek Amalfi villa, according to Oceania. The dark woods and fabrics have been replaced with more contemporary colors of blue, gray, and taupe. There is more storage and new cushioned headboards reach to the ceiling. Each suite and stateroom now includes plenty of USB ports and plugs, with some handily located on both sides of the bed. Each cabin also includes a state-of-the-art interactive TV system with movies on demand in multiple-languages, live TV stations and a program guide, plus itinerary information and weather updates. Every fixture and surface in the bathrooms is new, with designer features, new lighting, lavish vanities and the showers feature sliding French glass doors instead of shower curtains. Penthouse, Vista and Owner’s Suites bathrooms have been redesigned as luxury retreats, offering more space and outfitted with Carrara marble, polished granite and onyx. The OceaniaNEXT project encompasses all four of the Regatta-class ships. Next on the renovation schedule is Sirena this May, followed by Regatta in September 2019 and Nautica in June 2020. Oceania Insignia, OceaniaNext, ship refurbishments. Bookmark.